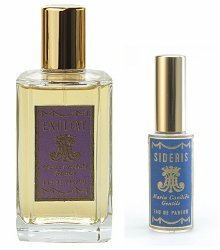 Today, quick reviews of two fragrances from Italian niche house Maria Candida Gentile: Sideris and Exultat. Both are in the brand's Classic Line. Sideris was born during a walk along a Mediterranean beach in Liguria (Italy) at night. The moment was so beautiful that one could feel like floating in the air, between the sea and the stars in the sky. It is purely poetic fragrance. With incense, cistus, myrrh, white pepper, saffron, rose, sandalwood, benzoin and waxed woods. I first tried Sideris last summer, around the same time that I reviewed the brand's Hanbury, and I liked it right away, but I set it aside thinking I ought to try more Maria Candida Gentile fragrances before I reviewed it (especially Exultat, to which it is often compared). I'm happy to revisit it now, as it's a perfect fit with the oddly glorious and un-July-ish weather we're having this week: sunny and mild, not too hot, not too humid, with a lovely chill in the air in the early mornings. It's not quite that Liguria beach, perhaps, but it's likely the closest I'll get to it this summer, and the weather gives the airy spiced rose incense of Sideris room to soar. Sideris starts peppery and bright, with touch of sharp aromatic greenery underneath a haze of soft incense. It sweetens quickly, and the base turns warmer, but only just so much: the overall feeling stays light and dreamy — and entirely unchurchy — even as the myrrh and amber notes join in, and a little later on, as the rose and saffron intensify. The base is a mildly vanillic honeyed woods, a bit milky, still rather airy but with just enough warmth that I think it would work equally well as a cold-weather comfort scent. The sillage, however, is subdued, even when applied heavily. Verdict: Sideris is a charming, easy to wear rose incense, and my favorite from this brand so far (I still have not tried all of them). It would fit nicely into 5 perfumes: incense fragrances for spring, or maybe fall? If the summer weather where you are generally stays milder than it does here, it might be a 4 season scent for you. It's on my buy list, and since it's sold in small sizes at a reasonable price, I might even buy it some day. The Exultat fragrance is inspired from the fragrance that the Italian families used to give during the wedding ceremonies. The white linen prepared for the ceremonies where purified with ash and lavender. The inspiration came from of a visit to the San Lorenzo church in Rome, where the sacred meets the profane, the spirit meets the material. In Exultat, the violet leaves and vetiver roots combine to the incense, and the rare violet leaf absolute brings the spirituality charisma of the formula. With incense, orange, bitter orange, lime, violet and violet leaf, precious wood, vetiver and cedar. As a number of commenters have mentioned, Exultat has much in common with Sideris, and this is especially true in the opening, which has a similar haze of incense, floating here over bright citrus notes with undertones of bitter peel. The citrus does not linger long; instead, the incense is joined by the violet (powdery and sweet, at least for a time) and violet leaf. I was expecting something transparent, similar to the rose in Sideris, but no, they're thick enough here to be almost chewy, and the incense becomes correspondingly less central. The base is a musky woods, rather dry, and it likewise takes backseat to the violet, which lingers for hours. The vetiver is quite noticeable when the violet leaf finally quiets, and likewise, the incense comes back into focus eventually. Verdict: I wonder if I would have liked Exultat better if I'd tried it on its own? Or in colder weather? Worn next to Sideris, it feels plodding and heavy, and not at all like the soaring blend of violet and incense I'd imagined. It is going in my purgatory basket, and with any luck I'll remember to try it next winter, although I'm guessing that even then, there will be other violet perfumes I like better. Do bear in mind that nearly everyone else liked Exultat better than I did, so it's certainly worth trying. Maria Candida Gentile Sideris and Exultat are available in 7 (€14), 15 ($45) or 100 ($185) ml Eau de Parfum. For buying information, see the listing for Maria Candida Gentile under Perfume Houses. I am a fan of Exultat, but if I haven’t tried it, your description (excluded the verdict, of course) would definitely tell me ‘must sample’. I should maybe have added that I’m not a massive fan of heavy violet leaf — I like violet, but violet leaf, well, it’s fine but this is a lot of it. The Tauer is airy but loud, this is airy but quiet. Less “rough-hewn” than the Tauer, less citrusy. I want to say the Sideris is more feminine, but I’m not sure that’s really the right word because I do think a man could easily wear it. It has a more delicate feel? And so a lemming was born! These both sound lovely to me. And I just found out today that my sister-in-law is getting married in Tuscany next year. Seems like both of these might be nice for an Italian wedding! Oh nice! Such a beautiful area, and such good food. Thank you for the great review Robin. I own Sideris and have been very curious about Exultant for a long time. I suppose I should order a sample. Oh do, it really does seem like most people like it. I tried Exultat first, in winter, and loved it. I did not like Sideris initially because the idea of a beach fragrance with incense just seemed wrong, but I began to enjoy it once I forgot about the origin story. I appreciate this line very greatly. The fragrances I’ve tried so far are like nothing else and very wearable. I’m glad you are reviewing them now, because it’s easy to forget about small lines like this. Ah, then maybe I really am out of season with Exultat. Hopefully it won’t get completely buried in the purgatory basket! Have you tried Cinabre, Robin? I got samples of the three of these and while I liked all of them, Cinabre was my favorite. But then, I’m a rose girl. No, and it isn’t among the 5 MCG samples I have left to try. Will add it to my list, thanks! Oh Yes! Sidaris is exactly what I must sample! Sideris smells absolutely amazing on TheGoddessRena. Couldn’t stop smelling her when she had it on. Must get my own sample. Lovely reviews, Robin, thank you. Maria Candida Gentile is one of my favourite niche lines, and “Sideris” is the fragrance I enjoy the most. It´s a versatile, light but surprisingly long-lasting scent (at least on my skin), wearable in (almost) every season. I´ve read lots of praise for “Exultat”, but I haven´t had the chance to sample it yet. I hope I will soon! By the way, have you tried “Barry Lyndon”? It´s another favourite of mine from this house, a truly excellent, outdoorsy fragrance. I have not yet, but will add to the list, thanks! Oh look what happens when you don’t pay attention – one of your favourites gets reviewed (favourably!) and you’re not on the button to comment! Seriously thanks for a lovely review, Robin. I went through a sample, then a 10ml decant then a 15ml bottle before I finally caved on a 100ml bottle (unheard of these days). It’s just so…wearable (and I don’t like obvious rose/amber scents! ).